It's hard to imagine but there was a time before the internet: books had sleeves not faces, birds were less angry, and the only thing Amazon delivered was a lot of rain in its forests. Ah simpler times. Today we are all permanently plugged into something, invariably all leading to the super information highway. Those three Ws are a key to a weird, wild and occasionally wonderful online world. In 2014, Ubisoft released Watch Dogs, which saw you playing as a computer hacker, hacking your way through the city of Chicago. It was an interesting premise, but was lacking in its EXECution. Not one to shy away from a sequel/franchise, Ubisoft have tinkered with their peering puppy and have unleashed 2.0 on the world. These Amazon deliveries are pretty impressive. 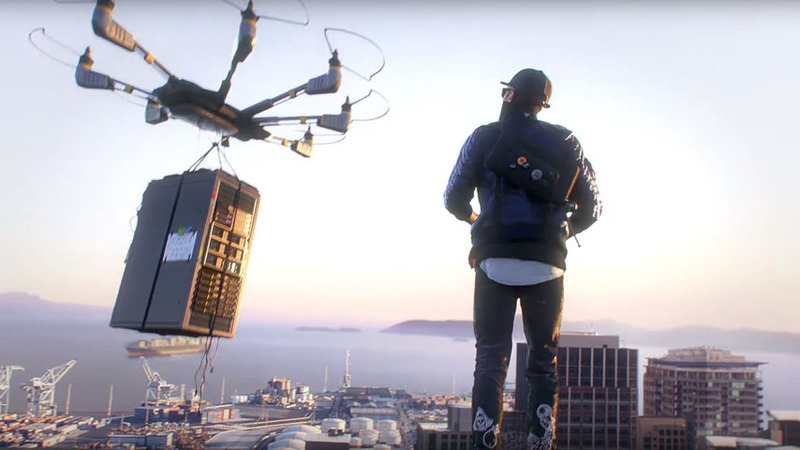 Moving to the other side of the coast, Watch Dogs 2 takes place in the hip and happening city of San Francisco, where you play hip and happening hacker Marcus Holloway. Unlike the first game, which saw the main protagonist fight against the system in revenge for the death of his niece, Marcus has no such personal agenda - he just wants to do it for kicks. He can't make much of an impact on his own though, so he joins DedSec, a bunch of funky hacktivists, and between them, they have the know-how to bring a whole heap of chaos and mayhem upon the city. Marcus is pretty handy with tech. He can hack traffic lights, cars, banks, buildings, oh and of course computers. It's a big, open world so there's plenty of exploring to be done in the bay area. The best way to get around is in a vehicle of your choosing, where you can tootle off to various missions. If you have played the first one, then this one will be easy to get to grips with. And that's part of its problem. There are no significant improvements on the first game here; the mechanics of manipulating traffic lights etc are still intact, as is the ability to steal money from citizens out and about. It feels more like DLC rather than a huge overhaul wrapped in a V2.0. It also feels like the game still isn't convinced by the whole hacking thing. Instead of relying solely on technology, Marcus can be equipped with an arsenal of weaponry, which means he can go into missions with guns a-blazing. But surely that defeats the premise of the whole game? In making guns so readily available, the technology angle is quickly reduced to nothing more than gimmickry, which is a real shame. What you then have is a character, running and driving around a large open world, going on missions and earning money. Sound familiar? That's right, it's GTA with wi-fi. Hacking's all well and good but when can we eat the damn donuts!!! So without committing totally to the hacking theme, Watch Dogs 2 is nothing more than GTA clone, but without the subversive humour. Much of what you can do here, like hacking a forklift or a building's exterior lift platform for cleaning, are hardly the most exciting propositions. And that's what is missing from the title: excitement. All the missions are pretty much standard, with no surprises whatsoever. Go here, do this, move on. And with a limp storyline, there's no real impetus to push on deep within the campaign. It's one saving grace may well be its multiplayer, which has a carefree drop in and out feel about it. It is its lack of conviction towards its own USP however that is most disappointing. Even more so for a sequel. You can tell it's a half-hearted gesture throughout. Maybe it was the fact that real hackers don't actually have to be standing outside or next to the thing that they want to hack. You don't need to know much about computers to understand that a 12 year old oik in his bedroom in Leeds can cause havoc in another country from his laptop, with the right knowhow. If you're a fan of open world games, where you can drive a vehicle for miles to a location, do some stuff, then drive off again, but with the added bonus of changing traffic lights or looking through some surveillance cameras, this might appeal. 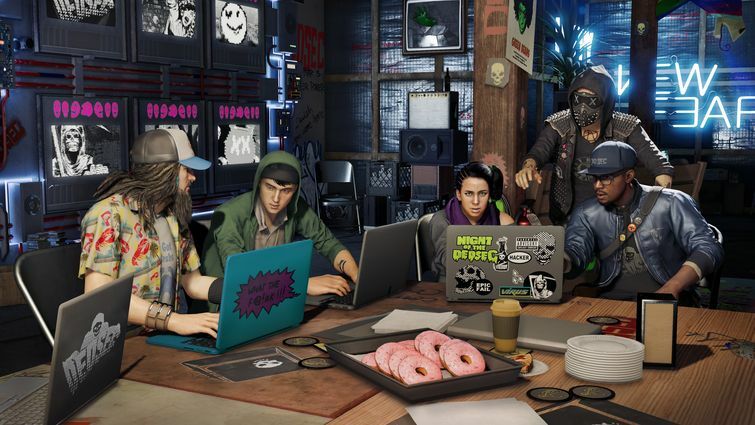 Without completely embracing its hacking theme though, gamers playing Watch Dogs 2 could be left with an overwhelming sense of disconnect.